X MARKS THE SPOT: Stick Tennis is now optimised for iPhone X and above. BUG FIXES: We’ve resolved an issue with the 2019 Slams where you’d be unable to resume your tournament after a premature exit. We’ve passed the solution on to Federer and Kerber. Published: 2013-02-04, by Peter Warrior. First at all, don't let you fool by the screenshots, or even any video of this game, because Stick Tennis is a native game for mobile devices that takes advantage of what our beloved little gadgets can do and leaves behind those flaws usual in computer gaming when ported over. The first that will shock you is that your characters smartly moves on his own, so you choose how to hit the ball depending on how you swipe on screen. Of course, timing is more than crucial, is the key, and you can bet that game gets pretty difficult and tricky very fast. Graphics and movements are limited to gain a perfect performance in order to get one of the best tennis -when not sport overall- game so far, with intense and thrilling gameplay. So bad there aren't any customization options, or fantasy shoots, or more game modes, or anything to boost spectacularity as replays or whatever. It'd also be appreciated a way to make matches shorter or a way to save ongoing matches. Anyway, here's a piece of game, recommended for everyone. 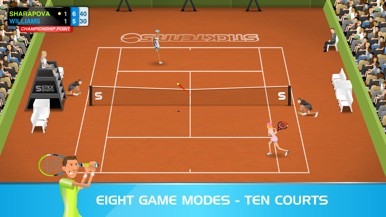 Easy to play yet difficult to master, Stick Tennis offers fast and fluid gameplay and a huge range of unique player styles and characteristics to unlock and play. 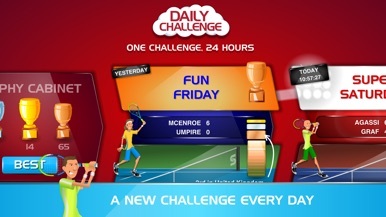 With just a simple one-fingered swipe you’ll soon be thumping crosscourt winners, yet at the core of Stick Tennis is a highly sophisticated physics engine that rewards tactical play.